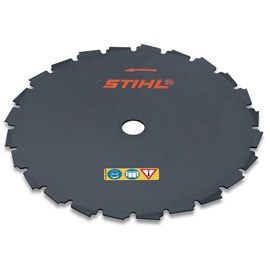 There are three types of saw blades available: The Scratcher-tooth saw blade has a very good cutting capacity and is also suitable for hedges. The Chisel-tooth blade has a smooth, soft cut and a low kickback. It is very easy to sharpen and provides a good cutting capacity. The Carbide-tipped saw blade is very robust and has a long edge life in normal applications. It is suitable for special applications in dry, sandy areas or cutting close to ground (ground contact).